I was 23 years-old when I sat down in a Starbucks in Sparks, Nevada, opened a notebook I’d stolen from the air conditioning wholesaler where I worked and wrote the first scene of what would become The Blackguard. 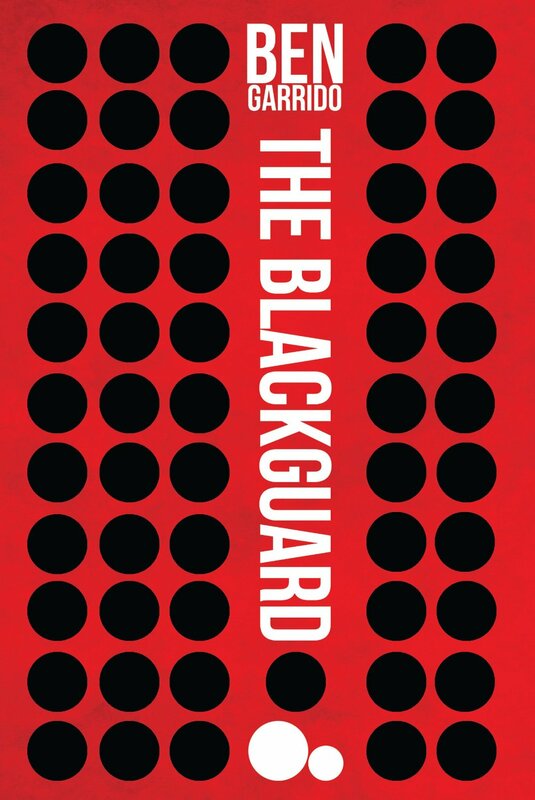 From a broad, plot-centric point of view, The Blackguard covers isolated community of white supremacists living in Enclave as they face Marcus (the narrator), urban sprawl, their own cultural annihilation. It’s designed to make you consider just how important inherited identities are, to make you pick between supporting virulent racists, corrupt businesses and the uber-ruthless Marcus. I really hope that, by the end of the book, you feel at least an understanding for the humanity in each. But on a more personal level, it grew out of the two central crises of my life at 23: the need to escape my destiny and a desire for vengeance like fire, consuming everyone and everything unlucky enough to get close. I hope you’ll pardon the self-indulgence. When I was about 12 years old one of my friends’ fathers bought him a big knife. It was a foot long, serrated on the back edge with a polished handle made from antler and my friend used it to skin rabbits. These things all impressed me. Asking to buy a knife of my own was out of the question – I knew better than to pressure someone else into spend money on my vanity – but I really did want one. About this time I found an old kitchen knife buried in the sand in the backyard. Buying a knife would be a no-no but making one, that seemed somehow virtuous. I sat down in the driveway and sharpened the blade. I figured out how to take off the handle, how to get rid of the rust. My dad arrived as I was sanding and looked at me with a kind of half-smirk that I’d previously seen aimed at window-lickers, street prophets, aggressive bums. The words came out both sweet and aggressive, like pouring a jar of boiling honey. When I threw the knife away that night, under the cover of darkness and away from any possible witness, I did so determined to leave the flock. If it meant getting a new set of friends, I’d deal with it. If it meant a lifetime of loneliness, I’d nut up and endure. If it meant wandering off somewhere nobody could ever help me, that was simply the price of doing business. This idea spread like mold through a wheel of cheese, indeed, going much farther than my father or anyone else had planned. I don’t wear the cowboy hats or Wrangler jeans so common in my hometown because that means melting and deforming so I can fit into a prefabricated identity group. I don’t speak during the pledge of allegiance because the uniformity of that activity makes my stomach turn. There are still very few things more disturbing to me than a night club dance floor, writhing in the strobe lights, indistinguishable from the heat and noise and sweat stained designer shirts – more like a colony of amoeba slithering across a petri dish than a group of human beings. And it spilled over into the book. The 23 year-old me thought about the identities he’d lost or rejected and wondered “what did they actually take away from my life?” When you can no longer be a cowboy, an American, a Muslim, what does that actually mean? If the black community falls apart and its members scatter to the wind, is that actually bad for the people involved? If the faith succumbs to heresy, if the language vanishes or the traditions die, must it be a bad thing? Marcus’ attack on the Enclavian way of life – both the racism and the sense of community, both the backwardness and the deep traditions – is born from these questions. Starting right around the time I graduated high school, I got poor. I don’t mean this in the “have to cut back on the partying” sense of poor either. I joined the cheapest gym in town so I could steal clothes out of the locker room. I discovered it’s possible to eat for a week on $7.14 so long as you really, really like frozen peas and bulk Top Ramen. I learned that holidays are actually the worst times of the year, when you can’t earn money but do have to feed yourself. Aside from the stress inherent in strategically bouncing checks and the like, I was relatively okay with the material part of being poor. The thing that I wasn’t remotely okay with was the loss of respect. Cops, seeing my torn blue jeans and six month old haircut, treated me like a drug dealer. Professors, seeing the second hand Wal-Mart brand shirts and threadbare shoes, assumed I was the dumbest student in their classes. People I had considered friends let it be known how charitable they were being to let me in their presence. Even the purest hearted strained under the weight of my suddenly diminished social status. I am a proud man. I always have been and so when I felt my social position changing, I fought back. When I saw people who didn’t work as hard, had less skill, achieved only in the sense of drinking games and yet still lorded their superiority over me, I broke a little bit inside. The rage and revenge I felt between the ages of 19 and 23 beggars belief. I would walk down the street and feel a visceral hatred for everyone I saw. I’d fantasize about pounding their surgically enhanced noses through the backs of their heads. I humiliated people, showing them up in front of their friends until it got a little awkward. Then I’d say something like “we can stop if you’re scared,” and then I’d ignore their answer and keep going until everyone present wanted to explode from the shame. I discovered most people are incapable of disrespecting someone they fear, and for a while, I was satisfied with that arrangement. Then, sometime shortly before I wrote that first scene in The Blackguard, I realized how tired the hate made me. The struggle, the anger, the revenge, the daily fight to get respect even if I had to tear it out. It was like a fifty pound lead weight in my chest, pressing down on my lungs, tearing small fibers in my neck. It was an emptiness that sucked at my extremities. It was drowning and it didn’t get better until I discovered an odd truth – it is possible to be utterly disposable and a capable human being at the same time. Once I accepted that people didn’t care about my personal qualities but did care about the brand name of my wrist watch, it made life much easier. Why should they care about me the person? Why should my personality matter? Why should they give a damn if I worked hard or had noble intentions? If I looked at it a certain way, I could even use it to my advantage. If I could kill off the emotional need for respect and be more rational, I could manipulate these people. I could feign humility and curry favor. I could suddenly extend kindness to those people who feared me and, in doing so, gain respect of a much more durable sort. I could style myself a self-possessed pillar of wisdom, even if I was nothing of the sort. I could be ruthless as all hell so long as I did it with a smile. I could do anything, so long as I canned the vengeance. Marcus wants to steal Enclave’s water. He takes apart an entire community, he destroys families and he does so with neither malice, moral justification nor revenge. If he must accept humiliation to reach his goal, he will. If he must betray his friends to reach his goal, he will. Marcus simply takes what he wants in the most efficient way he can and, in doing so, represented exactly what the 23 year-old me felt he needed to become in order to survive. He was at once an absolution, a cleansing away of the monster of vengeance I’d been, and a retreat into a worldview that was, even if calmer, deeply cynical. I don’t think it’s an exaggeration to say that we die and are reborn several times in a lifetime. My 30 year-old self, writing now to you, is a vastly different person than both the cynical 23 year-old and the rage-blind 19 year-old he was reacting against. I’ve mostly gotten the things those two were so desperate for. I’ve got my respectable job and nice friends. I’ve gotten a good deal of the self possession Marcus was designed to embody. I’ve got peace with my family and the re-discovered willingness to both love and be loved. I don’t want to go back. But that’s not to say we should look back on our past selves too harshly. If we learn at all, then by definition those past versions of ourselves didn’t have the tools and knowledge we’d use today. Of course they will fail. Of course they have follies. But they also have virtues. That 23 year-old, sitting alone, writing the first scene of The Blackguard, he was tough as all hell and he was trying so, so hard. A desperate striving, a seriousness and focus and yearning. There’s a purity of exertion the older, wiser me can’t match, a more innocent desire to go forth and matter in the world. One of the things I really like about The Blackguard is that, in a sense, that 23 year-old never went away. You can meet that 23 year-old and his 30 year old version by buying the book here.